Suite Sports: Yeezus, How Did We Get Here?!?! Yeezus, How Did We Get Here?!?! I recently wrote a review of Fast and Furious 6 where I wondered just how on the Earth the franchise had advanced from the first film about cars and the racing subculture of LA, all the way to the international heist/anti-terrorism summer blockbuster the latest installment was. Yeezus, the latest album from polarizing artist, lyrical genius voice of a generation, and gay fish Kanye West has the same feel. If you listen to his first studio album The College Dropout, a masterpiece from early 2004, then turn Yeezus on, you'd be hard pressed to find many similarities. Gone are the soulful rhythms that made that freshman album so listenable, and in their place are harsh electronic riffs and abrupt changes in pace. No longer is West just happy to be here (Only lobbing the occasional bombs at teachers and professors that said he would amount to nothing) and sympathetic to the temptations of materialism in hip hop. This time around, West has fully embraced his role as the most polarizing mainstream artist in the world, calling modern Black Americans that buy into the hip hop culture and materialism "New Slaves" on the album's fourth track. It is a stark contrast to songs like "All Falls Down" on College Dropout and "Can't Tell Me Nothing" from Graduation where he readily admits that he's even more guilty of materialism and self-consciousness than most. But it isn't just Black America that feels West's wrath, as he lashes out at mainstream America (Ahem, white people) for the seeming intolerance of interracial couples in his mythical-drum pounding second track "Black Skinhead." On the album's next track "I Am a God" (Sure to be the most discussed for a number of reasons) West has a brief conversation with Jesus, where the Biblical figure refers to West as Yeezus, hence naming the album… I guess. 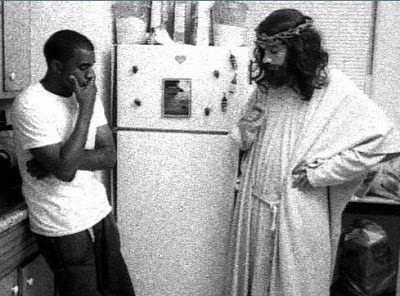 This part shouldn't really come as a surprise, as West has a seemingly ongoing dialogue with Jesus in songs like "Jesus Walks" and "Never Let Me Down" during his first album. All in all, West's full embrace of his controversial place in modern music makes this album read more like an early Eminem album with an electronic twist. Think The Marshal Mathers LP mixed with Bangarang. It's hard to really get a feel for it the first time around, but it is a good album. Though, admittedly, not a very fun one. I don't see college kids banging to this one at parties the way I did to "Gold Digger" and "Stronger" when I was in school, but I also don't think West is going to lose much sleep about it. After all, he claims he made this album just for the sake of making good music. With it, I'm sure he hopes to further his claim that he is the "Michael Jordan of music," but with this release he comes off more as LeBron James. His legion of fans is matched only by a hoard of haters, and his versatility and production abilities make him a more complete artist than somebody like Roc-A-Fella head man Jay-Z. Like Jordan, you probably won't find a casual fan that denies the greatness of Jigga. That is where West is now, still making great music, but his game has evolved to another level. Even with this evolution, you can't help but hate him sometimes and wish he'd go back to the artist he used to be. But, with everything he's gone through and his ego inflation, we all know that's impossible. I mean, the guy named his kid North West…. He better have two more kids named Mid and South.